When I agreed to go hands-on with Monster Hunter: World a couple of possible problems cropped up in the back of my mind. First, I have never played a Monster Hunter game. I’ve heard of the series, sure, but I’ve never actually tried it. Second issue? I’m not what you would call a fan of playing with others. Collaborative, competitive, it doesn’t matter; I’d rather play on my own, and I tend to avoid games that make you feel like a kid at a new school being pushed towards your ‘new friends’. My reticence for online play was, of course, only exacerbated by the fact that I’d never touched this game before. You know those people that get on stage at huge gaming events and play a live demo in front of a huge audience? I think they may be some of the bravest people in the world because you couldn’t pay me to do that. Performance anxiety is a thing. But in the spirit of the new year I threw all this aside. And what do you know – I enjoyed my time with Monster Hunter: World. In the east and the west, the long-running Monster Hunter franchise has a pretty dedicated following. These fans understand its intricacies, and the kind of thinking patterns that are needed to learn the ways of the beasts being hunted. It’s not the most accessible of game series, though, and it’s not entirely surprising that newcomers can sometimes struggle and give up entirely when they can’t break through this tough hide. There’s also been the fact that for a while now the series has been mostly limited to handheld consoles, not usually the platform associated with willingness to take on a steep learning curve. This is something that Capcom is aware of, though, and with Monster Hunter: World there’s been a deliberate effort to make things a little more welcoming for the series’ return to console. 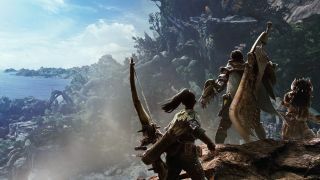 Settling in, I learned quickly that the aim of the game was to team up with up to three other players and hunt down monsters, using the spoils from victory to craft more powerful weapons and armor. This opens up more powerful monsters and the cycle continues. It seems simple enough, and it is. Each mission ends with exactly what you’ve gained from your victory, and allows you to easily sort through what you want to keep and what you want to sell. Scrolling through the menu for forging new weapons didn’t leave me feeling too overwhelmed, either. I didn’t get a close enough dig at this aspect to give much of a solid judgement on it but it didn’t leave me feeling queasy on first glance. I’d be interested to get a closer look at the crafting system as someone who’s usually utterly put off by them. Even the controls were surprisingly simple – your aggressive attacks are limited to two buttons and evading to one. This makes gameplay feel fast-paced and fluid. Of course, while combat controls are simple, combat itself isn’t. The depth here comes from understanding the different kinds of weapons you have in your arsenal, what they can do, and what kinds of combinations will balance out your team. I tried out a few different weapons while I was playing, including dual blades, great swords and ranged weapons. Each one made the mission feel different and I definitely preferred the rapid pace of the dual-blades, despite the fact that they don’t do as much damage per hit as a powerful but slow great sword. I’m the kind of person that quickly eats tubs of ice cream with a teaspoon – you can imagine why this method of combat suits me. It’s all about what works for you and what you can make work. As well as understanding your weapons, you need to understand the monsters you’re taking down. Each of the three monsters my team and I fought felt very different in terms of speed, attacking patterns and even the spaces in which they were fought. As much as increasing your avatar’s weapons and armor strength is important, being able to learn and even predict your enemy’s next attack is what could make the difference between defeat and victory. Though playing in a team isn’t the easiest thing in the world because it required genuine communication from the point of choosing weapons to the eventual defeat of the monster, it’s still great fun. Running through the game’s world to track down the monster together before taking it on is a nice build up (and really easy thanks to the trail of glowing Scoutflies which guide you there). It’s completely up to you whether the people on your team are just your friends or anyone from the global online servers. The battles are chaotic and it can get frustrating as three faints across the entire team means it’s a failure. But because of the strategic nature of combat and the different strengths of different weapons I never really felt like a useless member of the team. Monster Hunter World made me feel just as equipped to throw myself into the fight as anyone else around me - we were all learning this monster for the first time together and it was only by communicating the attack patterns we were learning to one another that the mission could be a victory. It’s to the game’s credit that after four defeats at the hands on Nergigante my team and I still decided to go in for one final try. We didn’t need to go and grind elsewhere, we just had to get the right weapon combination and use what we’d learned from our last defeats and we still had a good chance. We didn’t win, but the fact that we genuinely felt like we could was part of the fun. Of course, one of the best parts about Monster Hunter: World’s multiplayer is that it’s entirely optional. Thanks to the game’s sliding difficulty scale, it’s absolutely possible to play through the whole thing on your own. You’ll just find that the monsters you encounter have slightly less health. It’s nice to see a game of this scale that still makes the single-player experience feel just as valuable as the online multiplayer one, without the need for a separate story mode. Whether I have a team or not I can still wander through an open world that genuinely feels living and breathing. I loved that I could go looking for a monster and find it already fighting with another one. The world is colorful, the monster designs are fantastic and something I particularly loved was the sound design - every squelch and rustle made me feel like I was in a real forest or swamp. It’s not the height of realism - there are some cartoonish designs in character and weaponry but that’s just the Monster Hunter style and it’s far from a bad thing. Overall, Monster Hunter: World looks like it could be the game that helps the franchise genuinely break into the mainstream in the west. The global release date and accessible worldwide online multiplayer weren't accidents - accessibility was clearly the aim here. But the right balance seems to have been struck. I still felt like an utter novice when I’d finished my playthrough but I felt encouraged to work on that rather than deterred from trying again. After all, I need to beat that damn Nergigante. Monster Hunter: World has already had two open betas but there’s a third coming on January 19 through to January 22, before the game’s final console release on January 26 for anyone that’s yet to try it for themselves. As far as first impressions, this was a good one for me. Whether I’ll continue to feel as welcome in the Monster Hunter world when I get a good look at that crafting system remains to be seen but for now I’m looking forward to returning.